Whether you call it a snowball, shaved ice or snow cone, flavored ices are inexpensive to make and can turn big profits. It's easy to look at a long line outside a snowball stand in the summer and imagine just how much profit the owner is rolling in that day. However, like any business venture, opening a snow cone stand is not something you should jump into lightly. It's critical to always do your research first before taking the plunge into selling these sweet, chilly treats. Visit your local Chamber of Commerce or city hall to find out what permits you will need to start your stand and what the local laws are dictating the operation of such a business. You'll likely need some kind of business permit, a permit from the health department and more. Some cities allow people to operate mobile food stands that can be set up anywhere, while others only allow mobile stands to set up on private property. A handful of locales may require you to have a brick-and-mortar location to operate. Aside from ensuring your business abides by all local laws, all of these details may affect the profitability of your company, so you need to take these factors into account. You may want to set up a permanent stand, but you might also choose to operate your business as a pop-up. While a stationary location can bring in the most profit, it also requires the most investment and maintenance costs. You'll need to pay rent on a monthly basis (even if you only rent a small section of a parking lot for your trailer to park), and you'll need to pay employees if you don't want to be the only one working at the stand 100 percent of the time. On the upside, customers will know where you are located and can come back repeatedly if they like your product. If you're going to have a stationary location, you'll need to do a lot of research to ensure you get a good amount of foot traffic. Ideally, you should be in an area with a lot of children around, which should correlate to good sales. You may also want to get a location with a drive-through in order to take advantage of vehicles in the area. Be sure there isn't too much competition; after all, a snowball stand next to an ice cream shop and a frozen yogurt place is going to make a lot less money than one located by a dry cleaner and a ramen restaurant. If you're an on-the-go shaved ice company, you may want to start small with a one-person cart and one shaved ice machine. This may not be enough to help you rake in the big bucks but just operating at parties on the weekends can help you bring in upwards of $500 a month in your spare time. Of course, if your snowball business is successful, you can always expand the operation and get more small stands or get a truck to cater larger events. Alternatively, you may want to buy a food truck or a larger trailer that can hold multiple machines and can be set up at larger events such as farmers' markets and festivals or set up at the beach, near community pools or other areas where people are likely to want a snow cone during the hot summer months. If your mobile snow cone business is successful enough, you may decide to purchase more trucks or elect to get a permanent location. Take time to figure out how much money you can realistically expect to make operating a snow cone business. Research other shaved ice stands nearby to see when they are busy and when they are slow. If you're looking to operate at parties only, call a potential competitor and find out how busy their schedule is. Find out how much your competitors charge for each serving and how big the servings are. Compare the offerings at other businesses to see which has the best flavors, textures, etc. Ask your friends and family members which company they prefer and why. If you notice one has a particularly good flavor or texture, find out if they make their own syrups or where they get them, and if you like the texture, find out what kind of machine they are using. Find out how much syrup costs and consider whether you want to make your own or purchase it premade. Learn how much your product will cost once you take into account the cost of equipment, electricity, water, syrup and employee wages (if applicable). When estimating potential profitability, remember that this is largely a seasonal business and unless you're somewhere with hot weather year-round, you probably won't sell many snowballs during the winter months. So, while it's possible to make money hand over fist in the summer, if you don't have a plan for staying solvent in the winter, you're going to be sorry when cold weather comes. If you're going to operate a portable location, you'll need to decide on the right stand for your company. Do some research to find out what size of trailer, stand or truck will be right for your business and how much you can expect to spend. Once you've made a decision, keep your eyes out for deals and be ready to act quickly if you see one for a good price. Other than a location, you'll need at least one machine and probably more if you're operating a large business. Be sure to try the shaved ice made by the products before buying because most people prefer ice with a fine texture, but the machines that make such fluffy ice are often more expensive or take much longer to operate, which could reduce the number of customers you can serve at a time. Next, you'll need a cash register, a refrigerator for perishable toppings you might have and a freezer to store the ice blocks before they are shaved down. If you plan to make your own ice, you'll also need molds that freeze in the size and shape suitable for your new machine. For a permanent location, you'll want to invest in seating and tables. For all types of snow cone stands, you'll need napkins, cups, spoons, toppings, syrup bottles and syrups. The syrup can make or break your business as much as the machine. Take the time to taste potential products with your family members before buying them and remember that you may choose to make your own. Be sure to offer customers many flavors, as that will not only keep people happy when you have their favorite flavors but also keep them coming back to try new ones. Once you've got everything you need, you should be ready to open for business. If you decide not to purchase a block ice maker, you should contact local ice houses and verify that they can supply your stand with solid block ice. Jump-start your business by giving free samples on the first day of operation. FoodTruckEmpire: How Much Does it Cost to Open and Operate a Shaved Ice Stand? 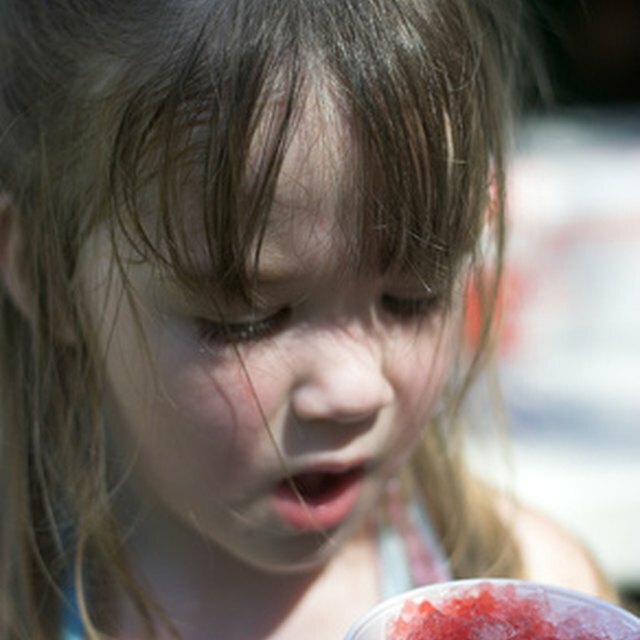 FoodTruckEmpire: What's the Annual Profitability and Costs of a Shaved Ice or Snow Cone Stand?